Klicken Sie an die Markierungsfahne für die deutsche Version. The son of a wealthy farmer, Karl Denke was born in Oberkunzendorf (near present Ziębice Poland). Karl Denke lived in Munsterberg, Silesia, Germany (now Ziębice Poland). He is believed to have killed between 30 and 40 people, primarily journeymen and homeless persons. Reports state that he had been engaging in cannibalism for several years prior to his capture. There are rumors that he actually sold human meat. He killed all his victims in his house on Stawowa Street. Apparently, Karl Denke was well liked in the community before his arrest. He is known to have been called “Vatter Denke” (which translates to Father Denke or Papa Denke) by the locals. He also served as the organ blower for his local church. On December 21, 1924, a coachman by the name of Gabriel, heard cries for help which seemed to emanate from Denke's room. Gabriel rushed down to help and found a young man named Vincenz Olivier staggering along the corridor, blood streaming from his open scalp. Before he fell unconscious on the floor, the victim blurted out that "Vatter" Denke had attacked him with an ax. Police were summoned and arrested Denke, scouring his apartment for evidence. They turned up identification papers for twelve traveling journeymen, plus assorted items of male clothing. In the kitchen, two large tubs held meat pickled in brine; with the assorted bones and pots of fat, detectives reckoned that it added up to thirty victims, more or less. In Denke's ledger, they found listed names and dates, with the respective weights of bodies he had pickled dating back to 1921. 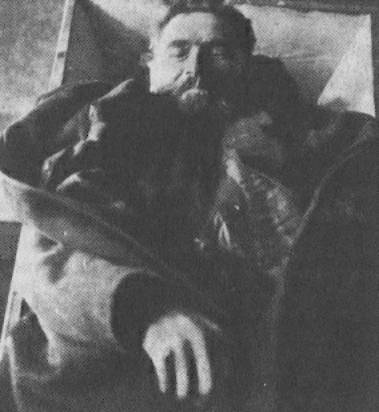 He killed himself in prison the night of his capture. Reports state that he hung himself with a noose fashioned from a handkerchief, leaving historians with no explanation or motive for his actions. His life was investigated by Lucyna Biały (the custodian of Silesian Library of Wrocław University) in the summer of 1999. Mrs Biały based her research on the German press of twenties. Her work was published by editor Tadeusz Dudź in “Gazeta Wyborcza” and "Gazeta Wrocławska". This article is one of the ones below. The Household Equipment Museum in Ziębice held an exhibition from July-August of 1999. The exhibit was entitled “An ancient iconography of Ziębice” and featured tools used by Karl Denke in his crimes. Webmaster's note: the information in the articles below is likely to be the most accurate information available currently on Karl Denke. It is from a very reliable source, and is much closer to the original sources than anything I have gotten my hands on yet. 1. He was not an innkeeper - apparently this rumor was started because of a bad German translation. No German sources that I have found say that he was an innkeeper, but most English sources do. 2. He died in 1924, not 1942. At one point, someone reversed the numbers and printed the information with 1942 as the year of his death. This has been repeated by several others. 3. Many sources say that he hung himself with suspenders, rather than a handkerchief. While that makes more sense, it is apparently untrue.